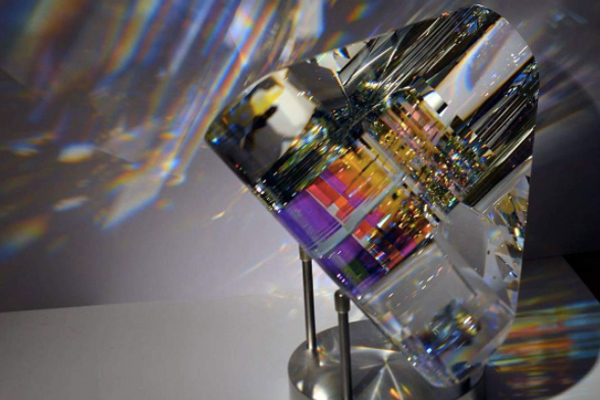 In your daily dose of beauty, we draw your attention to these glass sculptures, which look like holographs. They are insanely beautiful and unique. Thanks to artist Jack Storms, we’ve now been hypnotized by these glass sculptures. They are made of crystal and sculpted into one-of-a-kind shapes and designs. Trust us when we say, you won’t be able to look away. “Artist/Sculptor of Crystal/Shaper of color and light,” Storms’ Instagram profile reads. It might sound obvious, but this description is dead on. He truly can shape color and light through glass, and we’re in awe. According to Insider Art it takes months to complete a piece, and he uses a cold glass process. It might look like it’s simple, but it takes a LOT of work to make these magical creations. "It's a cut, grind, and polish, and repeat," Storms told Insider Art about the process. "Over and over and over again." Even though the artist has been working with glass for years, every piece keeps him on his toes. “It’s a discovery that keeps me anxious, it keeps me wanting to do more,” he explained. What’s even more impressive than the finished products is that Storms suffered an injury while working on one of the sculptures that left him blind in one eye. Since that accident he has had to retrain himself in regards to how he worked and how to judge distance. This hasn’t derailed his work or the quality of what he turns out. Instead it just makes us love the pieces even more. Can we get a set of these Vodka glasses and bottle please? The coolest part about these glass sculptures is that Storms lets them speak for themselves. “The greater meaning behind the piece, it’s up to the person who goes home with it,” he revealed. We totally agree with this mentality. Every piece is so stunning and different that it really does speak to the owner.